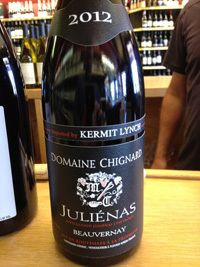 2012 Domaine Chignard, Julienas, Cru Beaujolais, France. This absolutely gorgeous Gamay was a real surprise and by far the best Julienas I’ve ever had, and while Julienas is my least favorite of the Cru Beaujolais, this wine might just have changed my mind, this without question was a game changer for me. Chignard, a top Fleurie producer imported by Kermit Lynch usual makes wines that get close to the famed estates of Foillard, Lapierre, Thevenet and Breton, so it was wasn’t out of the blue that this wine turned out to be so tasty, but the fact it was a Julienas, well that was a shocker for me, but I will happily eat crow, as long as I can wash it down with this lovely wine. The 2012 Chignard Julienas is lively, fresh and full of character with pure Gamay goodness from start to finish, there’s a nose of dried flowers, currants, candied cherry and walnut oil leading to a medium weight palate of wild strawberry, plum and red peach fruits with hints of pepper, cinnamon and iodine. There is a sweet and savory play in the layers of fruit that keeps this Beaujolais balanced and always focused throughout, this is a well crafted wine of style and class, I’ll be drinking a few of these over the next year or so, no doubt, I highly recommend checking this Julienas out.